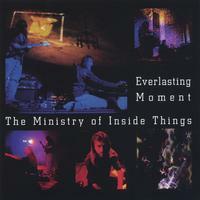 The Ministry of Inside Things, includes Chuck van Zyl on synths and Art Cohen on guitar. Their music has been inspired by the Berlin-School of cosmic spacemusic and influenced by everything from sci-fi themes to nuclear fission to chillout room abstractions. MoIT enjoys the live environment and uses it to further explore and invent their musical stylings. The ultimate goal is to create in the mind of the listener a sense of movement through space along the arc of a dynamic contour. Owing much to improvisation, each original performance traverses many sonic terrains. Cohen and van Zyl have had the opportunity to play live at a variety of interesting venues over the past several years. While their music touches on many of the hallmarks of Berlin-School Spacemusic (cyclical sequencer patterns beneath soaring lead melodies contrasted by passages of deep synth tones and glissando guitar), they bring their own influences and innovation to the process. The result is a sound that is uniquely individual. Everlasting Moment (2003) is the first conventionally replicated CD release from MoIT. Music from this double disc set has been drawn from several year 2002 performances and features definitive live versions of classic MoIT pieces like “Neutron Flux”, “Function Four” and “VM-75”. Each disc plays for about one hour, easily flowing through a variety of themes, moods and styles of Spacemusic.